As part of my suite of consulting services I am now offering a complete A to Z setup & launch service for those interested in starting (or migrating) their job board to the Jobboard.io platform. It’s the quickest, easiest way to get started in the job board industry. * Conduct a one hour prep call with you to plan the project, discuss details and answer your questions. * Explain what third party tools you need to sign up for such as MailChimp and Adsense. 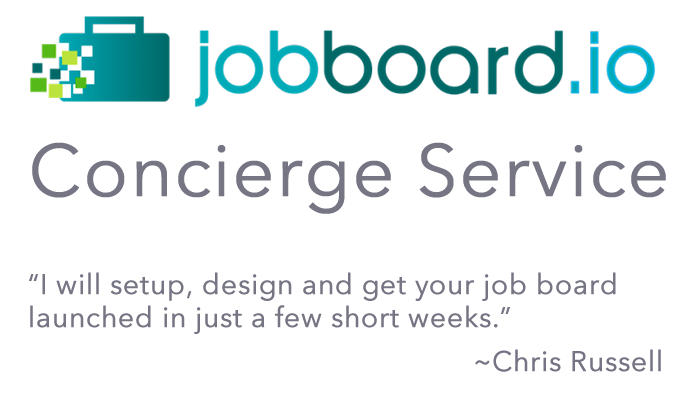 * Create basic logo and design theme for your new job board. * Configure your social media channels on Facebook, LinkedIn and Twitter and setup an auto publishing system for content. * Mentor you on how to market and sell to employers and job seekers. * Conduct one hour tutorial on how it runs and how to manage site going forward. * Free email support after you launch for up to 3 months. The cost to you is $1,500 (USD). NOTES: $1,000 is due up front with balance due prior to your final tutorial call. If migrating site from a current platform it may add $300-$500 to cost. Sample sites Chris has designed and launched: AviaNation, WallStreetCareeers, Jobs With Remote.